It seems we had just arrived to the point where we no longer needed to use the WWW when publishing the church's website address. Because people are accustomed to seeing .ORG or .COM and know it is a website, we have been able to drop the WWW. While not every church has done this, I know several have. Now, with people not yet familiar with the .CHURCH domain how will they know that your new domain with .CHURCH is actually a website address? In order to clearly communicate that your new domain is in fact a website address, I recommend using WWW for the next year or two. Then we should be back to the point where people are familiar with the new domain extensions and we can drop the WWW when publishing the website address. This is also more aesthetically pleasing than using “HTTP://”, which is more technical and odd-looking in marketing and communication material. Explain how this can be beneficial to the people of the church. This will need to be done for several weeks to drive home the point. Leverage the power of your congregation and empower them to share the new domain in their social circles. Provide them with text to they can Tweet and text. Provide them with images to share on each social media channel you use. Encourage them to share with their followers and friends. 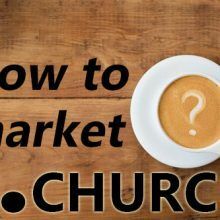 If your new .CHURCH domain is replacing your old church domain and not becoming a new resource on its own, then you can leverage your old domain instead of just letting it fizzle out. Instead of programming your old domain address to go to the homepage of your website, you can create a page on your website to which your old domain can point. On that page you can place text and/or a video explaining the new domain name and ask people to change their bookmark settings. On this page you can also encourage them to use the resources that you created in the social buzz section above to help keep the buzz going. What are your thoughts and ideas? Please share them with the community by commenting below.